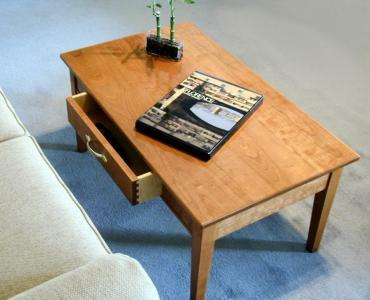 Coffee tables are a recent invention - there is no such thing as an antique coffee table. Nevertheless they have become an essential part of most living rooms, family rooms, and libraries. We have often used nitrocellulose lacquer, the material used for decades to paint cars, and the primary component of finger nail polish. Lacquer is not normally impacted by alcohol, water, food, or normal household chemicals, and is easily repaired. It is then rubbed to the degree of gloss that you would like - satin, semi-gloss, or high gloss (like a car or piano). Recently we changed to a high-tech version of acrylic lacquer (Target EmTech 6000), that cures to an even harder, more durable finish, similar to catalyzed lacquer. We also can use a conversion varnish. One of our customers first confirmed that the finish we use would not be damaged by alcohol. He then pointed out that these are often called cocktail tables, rather than coffee tables. I agree - our coffee table is used for books, remote controls, appetizers, and beverages, but is rarely used for coffee. One of our tables was built a little taller, so the customer could use it to eat a meal while watching TV. Which raises an interesting question. What are the tables called if you neither drink alcohol nor coffee? How big should a coffee table be? One of our tables was shown in a woodworking show, and was criticized as being too small - not the big square tables that was popular at the moment. I didn't have the opportunity to tell the judge that I have sold several at about this size, none of the "big square", and have had queries about even smaller tables. One of the tables below was built specifically to replace a big square table that "just collected dust and clutter." Answer - you can have any size you want! This cocktail table is solid cherry. The cherry wood starts as a very light tan, and darkens with age to a rich brown in a year or so, and ultimately to a deep dark brown in a century. This table was dyed to approximate the color that cherry would likely be in about 6 months, giving a head start to enjoy the piece but not interfering with the evolution in the color of the underlying wood. This table is far simpler than those below, with one drawer, opening from one side, and no shelf under the table. A similar unit was built from Walnut, stained dark, with poplar drawer sides and a finger pull rather than handles on the drawer. The legs are removable for shipping the Walnut unit. The overall size of these coffee tables is 36 inches long, 21 inches wide, and 17 inches high. The drawer is about 18 inches wide, and normally pulls out about 12 inches. There is one drawer, about 3 1/2 inches storage depth, with limited pull-out to so the table can be close to a sofa without "losing" items at the back of the drawer. The drawer sides of the cherry unit are baltic birch plywood; the drawer sides of the walnut table are poplar. Both drawers ride on waxed hardwood glides. The front is attached to the side with dovetail joints, and is grain matched to the surrounding apron (a single piece of lumber). The handle on the cherry coffee table is bright brass. 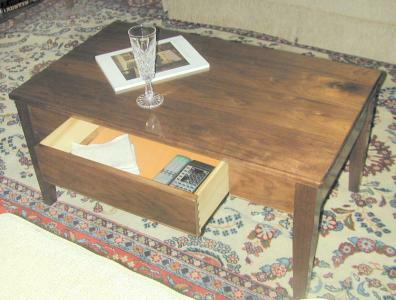 This coffee table was built from solid walnut, stained, with a satin rubbed lacquer finish. There is a full-size shelf under the table, and two drawers that can be opened from either side. The overall size of this coffee table is 36 inches long, 21 inches wide, and 17 inches high. The top of the shelf is about 4 inches off the floor, so a toe fits under the table without kicking it. There are two drawers, about 4 inches high, that can be opened from either side of the table. The drawers have antique brass handles, dovetail joints, poplar sides, and plywood bottoms, and slide on waxed hardwood tracks. 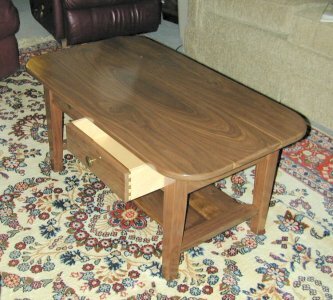 This coffee table was also built from solid walnut, in a natural walnut color. There is a slightly smaller shelf under the table, and two drawers that can be opened from either side. The size of the top is about the same as the unit above, but the base is smaller, allowing a greater overhang with substantially curved corners, giving a different appearance. Almost identical to the coffee table above, but with rounded top, minimal stain, and a polyurethane finish. Two drawers open from either side, and there is a 10 1/2 by 24 inch shelf underneath, about 4 inches above the floor Overall the top is about 20 by 36 inches, and 17 inches high. Each drawer is 15 3/8 deep, 12 inches wide, and 3 1/2 inches high (3 inches inside), with solid walnut fronts (both sides of the table), baltic birch sides, and an antique brass colored knob (rather than handles). 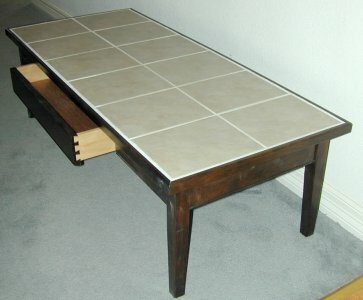 This coffee table was built with a tile top over plywood, with a wood edge, legs, and frame. The tile provides a durable surface and a far more casual appearance. This table can be coordinated to your home by using tiles to match those in your floor or fireplace - in fact makes much more sense with matching tiles. The sides and legs are dark stained walnut. The size, shape, color and style of the tiles we see for sale are different each time we look, and the final size of the table will depend on the size of those tiles. This style should be chosen for the appearance and function rather than the apparent lower cost. Most likely you will want to match the tiles in your home (there may be enough in the "spare" tiles most builders leave). If you want us to provide the tiles, the cost will be significantly higher, not just for the cost of the tiles, but for the time to find and choose them with you. Note that this table does not have a lower shelf, and does not require supports for the legs. 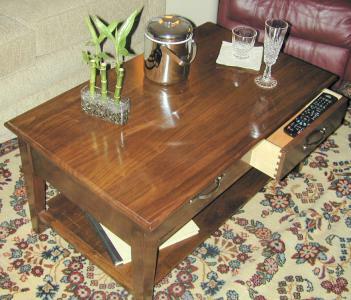 This picture is of a table 17 inches high, but another version of this table was built 21 inches high to "eat by the TV"
Coffee tables are closely related to end tables and other living room tables. Be sure to see the notes on end tables. The 36 inch length of the first three units seems good in front of either a 2 or 3 seat sofa, while still allowing easy access. Some coffee tables are 50-60 inches long, and provide more convenient service at a long sofa, but make it more difficult to get to the seat. Shorter tables are certainly fine where space is limited. The 21 inch width is stable and convenient. Some coffee tables are as narrow as 16 inches, but can be tipped more easily if they are bumped as a person moves to or from a seat, especially if the table is taller. Some coffee tables are quite wide - even square - but they take a lot of floor space in the room, and some people feel the larger tables collect clutter. The 17 inch height is a good compromise between lower tables that are less likely to be tipped, but require a greater reach when seated, and taller tables that can become intrusive. There is no standard answer for height - I suggest as low as 14 inches for stability with narrow tables or to reduce the intrusive feeling for a very large table, and possibly as high as 18-20 inches for a medium size table, if you want to minimize the reach. We even built one 21 inches high for someone who wanted to eat off the table while watching TV from the sofa. Most of our tables have been built with rectangular legs (tapered) and aprons to support the legs and tops. This classical design is relatively simple to build. We would love to make coffee tables with more exotic designs, but the cost is likely to be higher than the simple tables shown. Drawers (3 1/2 to 4 inches high) are popular whether to hold the collection of remote controls or for spare cocktail napkins and coasters. Some drawers can be opened from either side - which is sometimes very convenient, but there is also a disadvantage - there is no "stop" when the drawers are closed, so it is easy to have a sloppy look of a partially open drawer. Drawers add a fair amount of labor and material, so should be excluded if you don't think they will be used. Although the amount of material required to make the double-opening drawers is about the same as regular drawers, a few extra hours is required, largely because some dimensions become critical. A hardwood shelf should be made with a "breadboard" edge, so that the wood can expand and contract sideways without splitting. Then the breadboard end is set into the tapered leg. The material for the shelf is milled thinner for a lighter appearance. With these important steps, making the shelf takes as much (or more) time and material as making the top of the coffee table. If you want a shelf, it is worth doing, but if you don't think you will use it, simpler braces can be used, if desired, or actually the legs don't require any extra braces at all in tables with aprons. We have had to raise our prices since the price of solid hardwood has risen, and the quality has dropped (leaving much more waste). If you want a sculptured top (with tapered thickness, etc.) we need to use solid wood, but if you want a simple flat top, like most of these, we can substitute furniture grade plywood with solid wood edges at a lower cost. If we move to a plywood top (and shelf, if any) this may be an opportunity to use wood veneers - whether exotic grain patterns of common furniture woods, or featuring exotic woods. Veneers will cost more, but the savings in using plywood substrate rather than solid hardwood tops will take the pain away. This site (design and contents) ©2003,2013 by Charles A. Plesums, Austin, Texas USA. ALL RIGHTS RESERVED. We primarily serve Austin and the Central Texas area, but travel to the DFW area periodically and are glad to serve the Garland, Plano, Dallas, and other North Texas areas, and are willing to ship anywhere.